The year has elapsed and the next 70mm Film Fest regularly taking place in Krnov is knocking on the door again. Characteristic festival logo 70 KRRR! originated by Filmochod agency has several meanings: Mainly as an beginning of the name Krnov or assumed as interjection it evokes the typical noise from projectors and in combination with graphic design represents a number 70 arranged with fingers on hand. After a year the majestic cinema Mir 70 will become a place where true film fans of celluloid from many European counties - especially enthusiasts loving widescreen format - will meet. Three days of a rare occasion to see great 70mm movies screened on a 105 square meters of slightly curved screen and good opportunity to remember history of “old school” cinema technology in today´s sterile digital era. Unique cine-meeting prepares the Municipal Centre of information and culture Krnov under patronage of the Town Hall and mayor of Krnov together with State Cinematography Fund and with Association of Czech Film Clubs and supported by many volunteers. … and extra special thanks go to Thomas Hauerslev for invaluable help. And what can you looking forward to? See final film schedule below and notice special festival bonus – two attractive titles confirmed additionally. ŽOLDNIERSKI TRUD (short) 11:15 Poland 1973 13 mins. Lecture about Meopta Přerov by Vladimir Matula, MSc. A very interesting lecture presented by Vladimir Matula, MSc., who worked as a senior chief designer and a section leader of the Development and Design Division in Meopta Prerov and a general manager of „Meopta – projectors“ division in the nineties of the last century, when the manufacture underwent transformation. He actively participated in kino projectors development. The train station is called Krnov - Hlavní nádraží (Krnov - Main Station), from the staiton it is 1,6 km to the cinema. You can take Revoluční street, when you pass Albert hypermarket you turn right, then cross the bridge and on your right you can see the movie theatre "Kino Mír". Bus station is next to the Albert hypermarket so you cross the bridge and on your right you can see the movie theatre "Kino Mír". You get to the Prague Airport (PRG) and then you can go by plane from Prague to Ostrava (OSR, then by train from Ostrava to Krnov - Hlavní nádraží (Krnov - Main Station). Or from Prague to Krnov by train (change in Olomouc). Projectonists: Petra Pokorná, Martin Bodešínský, Pavel Tomešek and Martin Leskovský. 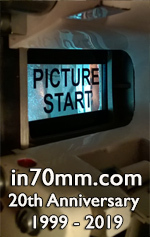 Projectors will be on display in the in Mir 70 foyer and everyone will be invited to visit the projection room. A small breakfast before the morning screening and some refreshment during the whole seminar will be on sale for all visitors.